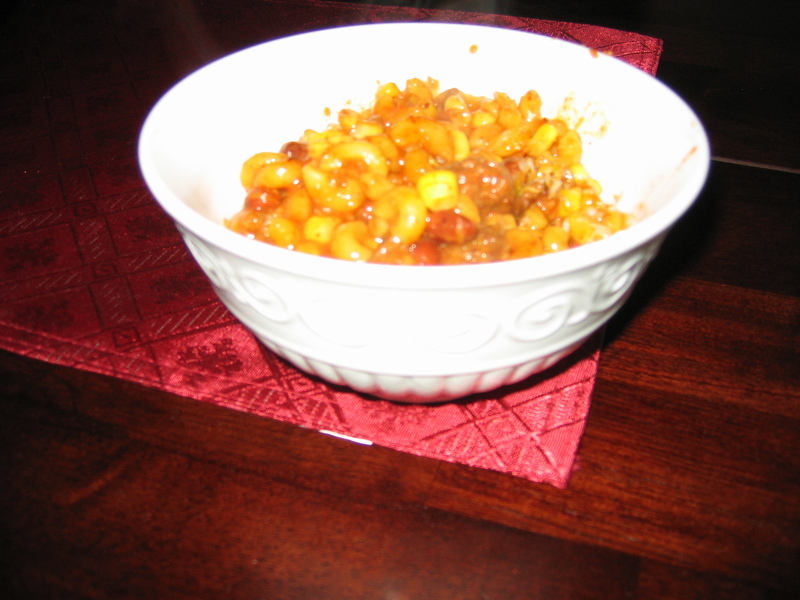 This recipe is a family favorite of my husbands- they call it Cowboy Delight. He asked me to make it one day, but I had no Kraft Macaroni and Cheese. A few weeks ago, I had bought some powdered cheese blend in a #10 can to give a try one day and had forgotten about it. Well – I figured this would definitely be a good recipe to try the cheese in since it was mixed with so many other things. It turned out fabulously. My husband actually said he thought the noodles done this way was a little yummier. I also didn’t have a can of chili with beans- so I just put in a can of red beans and chili seasoning instead. It worked out just fine. Oh and also, the butter in the macaroni and cheese can be substituted with 1/4 C of butter powder – I just skip the butter altogether, but once I gave Jodi mac and cheese without butter and she spit it out- so in case you wanted to know- you can use powdered butter in mac and cheese too. This meal could also be made without meat and cheese for a “completely” shelf stable ingredients meal.